It is clearly evident from the New Testament itself (Acts 16:13, Matthew 28:1, Luke 23:56), and historical writings like above, that the true believers and followers of Jesus Christ kept the 7th day sabbath as per the 4th commandment. But as we can see above, the professed Christians in Alexandria and Rome did not keep the Biblical sabbath. Instead, they started keeping Sunday in honor of 'some ancient tradition' - Pagan sun worship. When Jerusalem was destroyed, Antioch in Syria became the 'capital' of Christianity. From here, unadulterated Bible truth flowed to the rest of the world. But Satan had set up a counterfeit system in Alexandria and Rome. Alexandria was the place for worldly 'learned men', and was the place where Jews were compromising with pagan philosophy. Rome was the 'world capital' for paganism, and this greatly influenced the church at Rome. Then, an alliance was made between Alexandria and Rome! 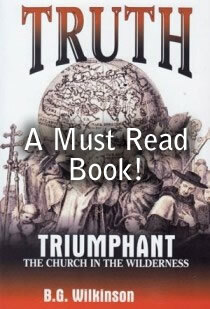 ← ← Please click and read this amazing book on true Christian history! The people of both Alexandria and Rome strove to exalt ancient tradition over Bible truth. Clement, the teacher of Origen, boasted that he would not teach Christianity unless it was mixed with pagan philosophy (Mosheim, Commentaries, cent.2, vol.1, p.341). And Victor I, bishop of Rome, entered into a pact with Clement around 190AD, to help make Sunday the prominent day of worship in the churches. Then as the Roman Church grew into power and dominance and God's true church was driven into the wilderness, Sunday became the prominent day. Today, Sunday keepers believe the 4th commandment is no longer binding under the new covenant. But what you are about to read is Bible PROOF that the seventh day sabbath IS still binding today. Ok, there is a lot of Biblical evidence that shows the seventh day sabbath to be an eternal "institution", which we will show below. But first let us confirm a Bible TRUTH concerning the sabbath day in the old and new covenants that CANNOT be refuted. How was the old covenant ratified (made valid)? If you read Exodus 24:8, you will see that it was through the shed blood of an animal that the old covenant was ratified and sealed. Do you see what is being said here? Paul confirms in the above Bible verse that NOTHING can be added or taken away from a covenant once it has been confirmed (ratified). Which means that nothing could be added or taken away from the new covenant that Jesus sealed with His own blood. Again, the example of a man's will explains this too. When a will and testament has been made by someone. Once he has died, nothing can be changed in that will. - Did Jesus change or abolish the 7th day Sabbath during His life? - When was Sunday keeping introduced? What we can say though is that the New Testament CONFIRMS the sabbath day commandment as still active in Matthew 12:8; Matthew 24:20; Luke 23:56; Acts 16:13. What about Sunday keeping? We all know that this was introduced AFTER the death of Christ Jesus (and NOT by the disciples like so many falsely believe). Therefore it was introduced AFTER the new covenant was sealed by the blood of Christ. And using the Biblical rule above that NOTHING CAN BE ADDED to the covenant or changed in the covenant, once the testator has died and sealed it, it means ... Sunday keeping CANNOT be part of the new covenant. Even if you still strongly believe that the disciples changed the Sabbath day, it still cannot be part of the new covenant, because it was done AFTER the covenant was sealed by the death and blood of Jesus. "Well, I keep Sunday in honor of the resurrection of Christ. There is nothing wrong with that!" ... I hear someone say. Ok, since when has our faith in Christ been about what WE want to do? Show me just one command from the Bible, where Jesus or anyone else says that we should honor the first day of the week. It isn't there. And yet there IS a command for us to keep the seventh day (our Saturday) as the sabbath. And we have shown above that this STILL REMAINS in the new covenant. Now in light of what we have shown you above. If you can see the next truth concerning the sabbath, then you will understand the eternal nature of God's commandments, and specifically, the sabbath commandment. So above we have the seventh day that God blessed and set apart during creation week and the 4th commandment concerning the sabbath day. Do you see that the day mentioned in each verse is the SAME day? Many Christians today claim that the seventh day sabbath only started at Mount Sinai. But this is just not true, as God is clearly saying in Exodus 20 above that the seventh day of creation IS THE SABBATH DAY. It was blessed and set apart from the other six common working days by God at the end of creation week. Therefore it MUST have been instituted right there and then. Which is why God said "REMEMBER" the sabbath day in the 4th commandment. Remember the day I set aside for you at the end of creation week. God is pointing us back to creation week in the 4th commandment! So what does this mean? Have a real good think about this and be true to your God when He opens your eyes to a new truth. It means that the seventh day sabbath was instituted and being kept by Adam and Eve BEFORE the fall. And THAT means the sabbath was instituted BEFORE sin entered this world, which means the seventh day sabbath was meant to be kept for ALL ETERNITY, and could NEVER be changed or abolished by any man. It also means that the sabbath was instituted BEFORE there were any Jews, proving that the sabbath was not just for the Jews. Jesus Himself said that NOTHING shall pass away from the law until heaven and earth itself passes away (Matthew 5:17-18). Has heaven and earth passed away? No, therefore the law (ten commandments) STILL STAND. And we know Jesus was talking about the ten commandments, because if we take Matthew 5 in context, then we can see from verse 21 onwards, He is teaching about the law contained in the ten commandments. Friend, the seventh day sabbath IS part of the new covenant. But Sunday is NOT part of the new covenant. This is the Bible truth. Jesus didn't come to do away with the ten commandments or the sabbath. He came to TEACH US HOW TO KEEP HIS COMMANDMENTS. The mistake that many Christians make is merging the ceremonial, sacrificial laws in with the ten commandments, thinking that Jesus nailed it all to the cross. But that's not so. The ten commandments and the ceremonial laws are two distinct laws. The one (ten commandments), Jesus came to exalt and teach us how to keep. The other (ceremonial, sacrificial laws) were a "shadow of things to come" and "nailed to the cross". The sacrificial laws pointed to Christ Jesus as our sacrifice. But the ten commandments are God's eternal moral laws that will stand forever! For more amazing truth about the sabbath and the ten commandments, please see this sabbath website and this site about the law. If you learn the truth about the mark of the beast, you will see why the sabbath day of the 4th commandment is a very important issue in relation to the end times.